Budapest is a city of princess castles and thermal spas! I felt like the center of Budapest is full of beautiful and majestic buildings and plenty to see and do. This article will guide you through the must-sees of Budapest as well as a tips for accommodation and moving around in Budapest. 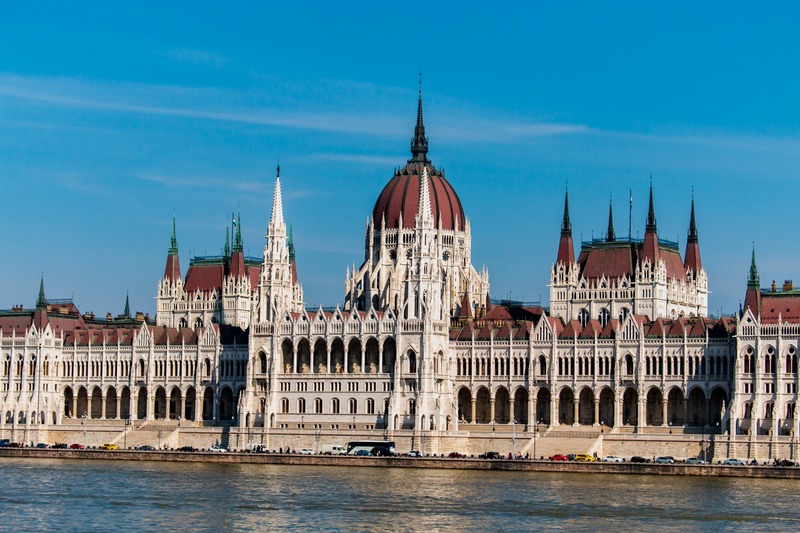 The Parliament building is the most beautiful piece of architecture to my mind in Budapest! It looks gorgeous with its lovely surroundings. On one side it has the mighty Danube river and a park on the other. I heard the building process of the Parliament building wasn’t the easiest though. The soil was wet due to the river bench and they had to build layers of harder substance. And because of the brittle exterior material it is also always under construction somewhere – but it was totally worth building if you ask me! Amazing architecture and such beautiful weather! Fisherman’s Bastion is a fairy tale princess castle! I absolutely loved it! There are many towers and some of them you can visit without paying the entrance fee. There must be great things to see when you pay the entrance fee but I skipped it this time. I only visited the free parts of the Bastion which were also super nice. My favourite place in Budapest was the fairy tale castle of Fisherman’s Bastion! I didn’t know about Vajdahunyad Castle until I saw it on the other end of a pond in Városliget park. It’s definitely worth seeing! I didn’t go inside the castle but there’s for example the Hungarian Agricultural Museum that you can visit. If you’re lucky with the weather I recommend visiting Városliget park and have a picnic there. It was a beautiful Sunday when I was there, and it seemed like all the locals had come to enjoy the weather to the park. Budapest princess castles were to my taste! Great Market Hall in Budapest is worth seeing even though you wouldn’t have the intention to buy anything from there. The architecture is really nice and there is a lovely vibe with people talking cheerfully and vendors shouting out their offers. Great market hall in Budapest has such cool interior! I was lucky with the weather and during my trip it was perfectly sunny. I took a river cruise from a company called Legenda because it was included in my 72h Plus card (more on the card below). I really liked the cruise! I sat on the sundeck admiring the beautiful Budapest with a glass of sparkling wine in hand. The cruise ships have an indoor space too if the weather is unstable. During the river cruise I learnt so much about the history of Budapest from the headset that even had Finnish language, wow! The cruise takes approximately 1 hour and 15 minutes and there’s a possibility to stop at Margaret island during the warmer months. Sparkling wine with a view! Loved this river cruise in Budapest! Buda Castle is one of the must-do’s that I had to leave for the next time. I saw it from the distance but eventually I didn’t have time to visit it. What I value the most in a hotel is great service and comfortable rooms. Adina Apartment Hotel delivered all of that and even more! The service in the hotel was excellent and the staff were true professionals at their work. They had eye for the detail and I felt very welcome in the hotel. The rooms are more than comfortable, they are spacious apartments with all the amenities that you need. Adina Apartment Hotel has really nice decor! Let’s begin with what all did I like about my apartment apart from that it was really spacious. The most important thing is that the bed was really comfortable, and I slept really well through the night. The apartment had plenty of seats and a nice sense of style. It also had a fully equipped kitchen with a full-sized fridge and a freezer. I really enjoyed my balcony that was overlooking to the courtyard and that had sunshine during the afternoon hours. There is also a bath which I had to try once since I couldn’t resist the temptation to relax my feet in the hot water. The hotel has a spa area where they have a pool and a hot tub as well as two saunas, a traditional one and a steam sauna. It was great that I was able to enjoy these amenities basically alone (one man went swimming once and another was at the gym). Especially the hot tub was amazing! The warm bubbles got me completely relaxed! Indoor pool and hot tub just for me in Adina Apartment Hotel! I usually say that cities are easy to see by foot and walk around but I have to say that in Budapest you really need a travel card. The distances between the places are surprisingly long. A travel card will really ease your life in Budapest. During my trip I had a Budapest 72h Plus card since I was there for three days. It was not only for travel as it also gave either free access or a discount to some sights and museums. With that card I also took the free river cruise I mentioned earlier and even got a free chimney cake! You can buy the travel card for your stay for example from the tourist information centre at the airport. With the Budapest 72h Plus card there was possibility to get a door-to-door service from the airport to the hotel by miniBUD but it didn’t work out for me. When I went to the counter the lady said that it will take 20 minutes until the car will be here due to heavy traffic. I decided to wait and I waited 25 minutes until I went to ask the lady again where is our car. She said 15 minutes more. That’s when I had enough and cancelled my way to my hotel as well as my return ticket, I don’t want to be late for my flight. So due to my experience I cannot recommend that service. There are other options to get from the airport to the city center. You can take the bus 100E straight to the center with a special ticket or use your travel card with 200E and change to metro line M3. After waiting for the miniBUD for ages I decided to try the 100E. I tried asking the old lady who was guiding people in, that do I need to buy a separate ticket for the bus. She just waved me to go away. I tried again but the same happened. Frustrated, I didn’t want to use another hour for 200E and the metro and I had no clue how to use them and the driver couldn’t help me (and my internet didn’t work) so I took a taxi. I can also tell you that I was quite pissed off at that point as it was already quite late in the evening. And by the way, there was no traffic! Remember that there are many other free things to do, especially museum entrances with the card that aren’t mentioned here. The prices are form March 2019. Hungarian wines totally surprised me! They are delicious! If you are under the impression that Hungarians only make horrible wine for teens to get wasted, I’m glad I can guarantee you are wrong. It used to be like that a couple of decades ago when Hungary was ruled by communists. Now things are different, and they have started producing quality wine with a bit more white than red wine as well as some sparkling wine. First wine was the sparking wine which was really tasty. The tasting itself is an experience worth taking! I did a wine tasting in the Tasting Table provided by Taste Hungary. There were altogether 4 people in the tasting and we had our own awesome host called Lilla. She was really enthusiastic about Hungarian wines that she got me into them. She had so much knowledge about wine producing and about the differences between the wines and regions they come from. She had also chosen a great variety of delicious wines for us to taste. These Hungarian wines were really to my taste! The wine tasting was held in a place called Tasting Table which is near the Hungarian National Museum in a cozy cellar. There is a space for bigger parties and a smaller room for more intimate events like the wine tasting. Spa is a must-do when you’re visiting Budapest! There are many different thermal spas that vary from tiny to large and from beautiful inside pools to huge outdoor pool areas. The most famous are Széchenyi Spa and Gellert Spa but there are many others. I chose to visit the most iconic one: the Széchenyi Spa Baths. My decision was mostly based on that it was a stunning weather and I knew that the outdoor pools in Széchenyi are amazing. If it had rained I would have gone to Gellert which is more known of gorgeous architecture indoors. The must-take photo at Széchenyi Thermal Bath. It was 24 degrees Celsius and clear sky when I visited Széchenyi Spa. I have to say that I wasn’t the only one who had made that choice. I’m glad I went clearly before midday because in the afternoon there was a big crowd. The spa is definitely worth seeing and if you can go on a weekday it will probably be less crowded. When I went to the spa I was confused because there are no signs directing you anywhere or at least I didn’t see them. The entrance was next to the cashier through a gate where you need to activate your bracelet. Then on the left there were doors in a row, some open and some closed. Go inside from an open door and close both doors. Then you need to open the bench entirely and that will prevent the doors from opening. When you’ve changed your clothes leave your things in a closet which opens and closes by using your bracelet. Then head to the shower and it’s time to bath! The thermal baths were amazingly relaxing. I could’ve stayed in that warm water for forever. It was the most perfect way to end my trip in Budapest. Széchenyi Spa got crowded during the afternoon since the weather was pretty much perfect. In Budapest there are many shopping areas and shopping centres. I went to ÁRKÁD shopping mall at end of the underground line M2. There were plenty of shops to go to. Similar shops you can also find from the center of Budapest on Vaci Street which is the main shopping street in Budapest. Chimney cake is a must when you travel to Budapest! If you’ve been to Prague you might find the Budapest kürtőskalács and Prague trdelnik quite similar. But I must warn you, one chimney cake is pretty big! I ordered one with chocolate and I couldn’t finish it. It was too much chocolate and sugar even for me haha! So if you are traveling with someone I highly recommend sharing one at first. Ruin bars are a must on your trip to Budapest! Those bars are located in old buildings where they have renovated big halls into bars. The one I visited, Szimpla Kert, had bars in 2 different levels and the bars have different styles. Take my advice and arrive there early to find a comfy seat. It’s such a quirky place that it is definitely a must-see. Don’t miss the ruin bars in Budapest! Budapest was a bit of a challenging city to take in. It’s a large city with multiple centers and moving from one place to another requires usually a car or public transportation. But Budapest is a beautiful city that is definitely worth discovering! Check out also my travel guide to Prague! Traveling in Amsterdam: Expectations vs reality?